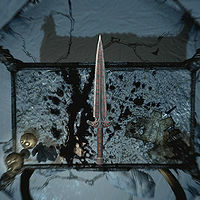 Bloodthorn is a steel dagger found upon a sacrificial altar atop Hag's End in the grasp of a dead witch. Its enchantment soul traps a target for three seconds upon hit, as well as draining health from the injured party for ten points. Tempering Bloodthorn requires one steel ingot as well as the Arcane Blacksmith perk, with the improvements being twice as good with the Steel Smithing perk.